Nicu's Spoon takes the adventurous step of casting a disabled actor in the title role. 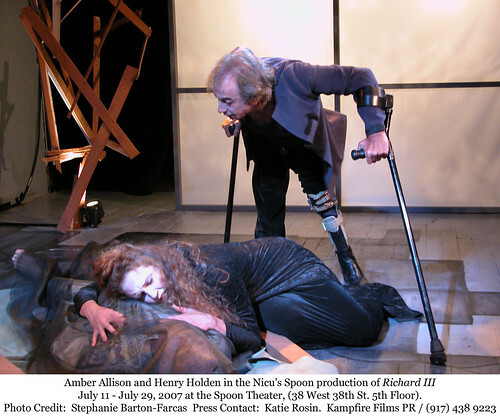 In their current production of Richard III, Shakespeare's most over-the-top masterpiece, the Nicu's Spoon company takes the adventurous step of casting a disabled actor in the title role. Henry Holden drags and clanks about the stage using crutches and an artificial leg, diminutive (though not hunchbacked), leather-faced, red-eyed, suitably monstrous but painfully human. Director Heidi Lauren Duke doesn't need to take liberties with the text to show how Richard's evil nature could have come from a lifetime of being shunned for his deformity. And she and Holden make good use of the crutches, the leg, and the actor's entire frame as in-your-face props. As a Shakespearean actor, Mr. Holden has limitations. He can't (or chooses not to) reconcile his angular New York accent with the rhythms of the text. This becomes a bigger issue in conjunction with the production's other innovation: Holden speaks Richard's lines only when alone on stage. In dialogue, another actor, standing in the corner with a lamp and a book, reads Richard's parts while Holden mimes. On the strength of his voicings, Andrew Hutcheson, who does the line readings, seems a fine actor, and I would really like to see him in a full-fledged classical theater role. But the contrast between Holden's New York speech patterns and Hutcheson's beautiful enunciation of "standard American" Shakespeare-speak is distracting. Also, because Hutcheson is so good, the eye is too often drawn to him when it should be focussed on the physical Richard on the stage – but that Richard is mum. The idea is to make Richard's two-faced nature explicit. But in a small box theater, where the audience is practically in the midst of the action, the conceit stumbles. It might work better in a larger theater with a proscenium stage. In other ways the production makes very good use of the space. Victoria Roxo's set design and Steven Wolf's lighting adeptly turn the floor from throne room into Tower prison into battlefield. There's very little stage furniture – just a small archway and a couple of things to sit on. One of the latter, in synchronicity with the new Transformers movie, changes splendidly from a chair into a stepladder. Their stolid woodenness, along with Richard's crutches and leg, emphasize the pure physicality of the action, which heightens the sense of immediacy in the production's best scenes, many of which occur in the latter half of the play: Richard's crowning; his eerie dream sequence; the powerfully and silently played later murders; and the battle scene and Richard's final comeuppance. The bard gets mixed results from this cast. Amber Allison is powerfully touching as Lady Anne. Simultaneously solid and reedy, she does well in a range of smaller roles too, although her femininity makes her portrayal of the murderer Tyrell a little hard to believe. (It's difficult to entirely avoid that kind of problem when putting on a play like this with a small cast.) Meanwhile, movie producers who'd like, but can't afford, Orlando Bloom might want to take a look at the talented Jason Loughlin, who brings gravity and luminous magnetism to the roles of Clarence and Richmond. But Wynne Anders, as the spectral and half-mad Queen Margaret (dressed up here like Mimi on The Drew Carey Show), chews her lines to the point of lockjaw, playing Margaret as so continuously thick with anger that Shakespeare's language gets mired in the venom like bugs in amber. There's over-the-top, and then there's fallen off the cliff. And in the important role of Queen Elizabeth, Rebecca Challis pours out her lines so fast they are often incomprehensible. One really wishes she'd slow down just a little, because she's obviously very talented. Elizabeth is the emotional center of the play, and Challis is brilliantly emotional. Finally, Jim Williams is a curious case. As Buckingham, Richard's co-conspirator, he's lightweight and uninteresting. As King Edward he's spectacular. 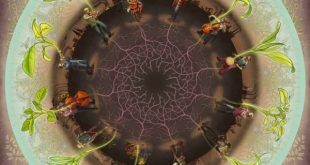 Verily, the head spins. There's a good deal to like about the production, especially in the second half when tension mounts and the pace quickens. Duke, along with the imaginative fight choreographer S. Barton-Farcas and the intent, muscular, and highly mobile cast, convincingly evoke an England darkened by Margaret's curses. One's heart is wrung by the passions of Ann and Elizabeth and the dying King Edward, and one can almost hear the armies massed along the coast. And, as the producers intended, we come to know a Richard whose disability has engulfed and twisted his character. If only one could focus more surely on the man himself, crutching across the stage.